Micro-chip your dog. Make sure you keep the details CURRENT. So many dogs lost and found have outdated information on their chips when checked. Compulsory micro-chipping became LAW on 6th April 2016. Ask your vet to check the chip every time you visit: make sure its still working or hasn't moved position. A collar and dog tag are excellent means in which a lost dog can be found and returned to their owners by honest people locally. A dog should be wearing this when outside of the home. NEVER leave your dog unattended outside a shop. You may return to an empty space. Treat your dog in the same way as you would anything precious. You wouldn't leave your laptop or a child outside of a shop unattended, why do this to your dog. 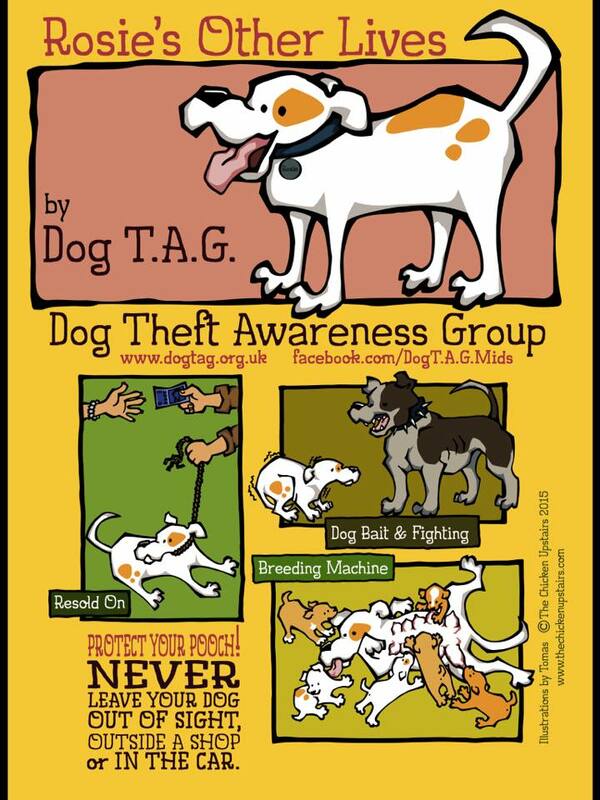 It takes seconds to steal your dog!!! This also relates to leaving your dog in a parked car too. Be vigilant that thieves grab dogs from owners while on walks too. Keep your garden secure. Over 50% of dogs are stolen from gardens. Keep a watchful eye on your dogs when in the garden. DO NOT give thieves an opportunity to take your dog. When being walked off-lead make sure your dog is in sight at all times. Be vigilant that thieves can target your house. Do not advertise in windows, on gates etc that a certain breed of dog 'lives here'. Keep dogs away from windows when you are out, keep your dog in a room that isn't easy to see into from the street. Be aware of suspicious activity of individuals 'hanging around' your house. Take regular photographs of your pets from various views showing their makings or any specific details and be ready to use them if required.